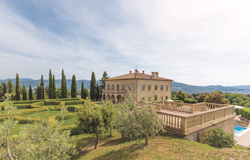 The palace is perched on a pleasant, peaceful promontory in the heart of Tuscany, just a stone's throw away from the famous city of Volterra. The 17th-century "Corneto Palace" has been fully restored according to 19th-century design tenets. The furnishing of the apartments have geometrical stone flooring and wood furniture. Moreover in the palace our guests can enjoy a great space of the original vaulted hall. 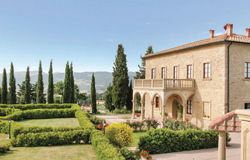 An Italian garden, whose beauty can be wholly appreciated from the terraces and upper floors, further accentuates the building's neoclassical style. The architecture of the swimming pool reflects the style of the palace and, with his irregular shape, it has the effect of a fountain in the Italian garden.